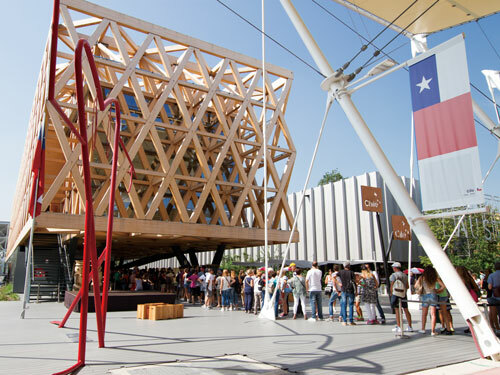 Visitors to the pavilion were invited to El Amore de Chile - Love Chile - with an introduction to the nation's diverse food culture and production methods. The exhibition offered a taste of Chile's biodiversity and breathtaking natural beauty while promoting the need to protect water resources and apply sustainable food cultivation practices. Among other attractions, such as physical and multimedia artwork displays, handmade furniture, and the Chilean ‘dinner table’ with its bounteous food and vivid colour, were a number of immersive video installations by Panasonic. These included interactive video touch-screens, a four-panel video wall at the entrance, and a massive nine-projector panoramic vista enhanced by Panasonic’s geometric adjustment suite and edge-blending technology to guide visitors through Chile’s abundant ecosystems, from oceans and rivers to mountains and deserts.